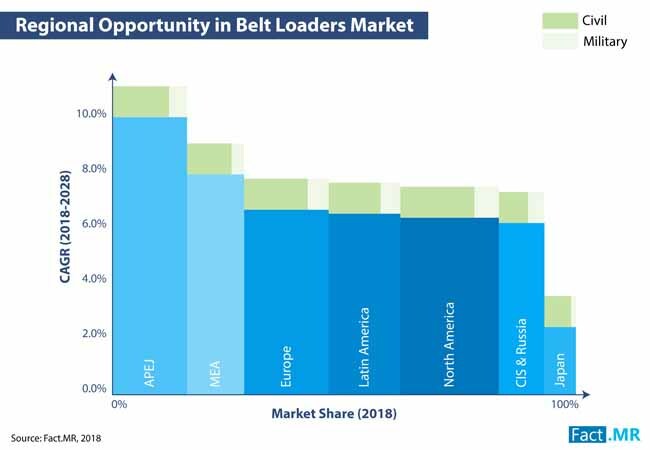 Growing preference of airlines over other means of long-distance transport in the emerging economies of Asia Pacific has positively affected the belt loaders market. In the latest market intelligence research by Fact.MR, rise in number of travelling demographic coupled with burgeoning air traffic is foreseen to drive the belt loaders market. In addition, belt loaders has been gaining significant demand from military and civil applications for handling luggage, which in turn escalate the market growth. The belt loaders market in Asia Pacific is further influenced by rapid urbanization, industrial expansion, and technological advancements. Advent of belt loaders with sensors that detect obstacles and reduce risk of damage in baggage handling is likely to create lucrative prospects for Asia Pacific belt loaders market. Further, development of electric belt loaders in response to increasing carbon footprint and energy consumption is expected to attract various consumers and stimulate the market revenue. Increase in deployment of belt loaders for various industrial requirements in airport, retail and automotive sectors is expected to bode well with the growth of belt loaders market in Asia Pacific. According to the Fact.MR’s study, the Asia Pacific belt loaders market is likely to witness a robust growth over the assessment period, expanding at an impressive CAGR of 9.8%. The market will remain concentrated in China accounting for highest share in terms of both value and volume, with India complementing the growth of the market. The report forecasts the global belt loaders market to be optimistic throughout the forecast period. Over 14 billion units of belt loaders have been envisaged to be sold by 2028-end, approaching a value of US$ 700 Mn. On the basis of product type, maximum sales of the global belt loaders market is likely to be generated by self-propelled belt loaders. This segment is expected to maintain a dominant position in terms of revenue during the forecast period, owing to enhanced functionalities and features. Self-propelled belt loaders offer right-sized performance which accelerates their demand over other products. End use of belt loaders is expected to be relatively higher in civil segment, due to growing number of airports as well air passengers across the globe. By region, despite faster sales growth in Asia Pacific, North America will continue to subjugate the global belt loader market with highest value share. Presence of top-notch companies and widespread of airport in developed nations are anticipated to contribute to the growth of belt loader market in North America. In addition, demand for belt loaders in Middle East & Africa will possibly observe a rampant growth in the coming years. Although the global outlook of belt loaders is expected to remain positive, challenges associated with high price is expected to pose an obstacle to the market growth. It is further likely to be affected by risk of operational hazards and lack of skilled labors. Detailed profiles of leading players participating in global belt loaders market are mentioned in the report. Some of them include Mulag Fahrzeugwerk Heinz Wössner GmbH u. Co. KG, JBT Corporation, TLD Group, Aviogei Airport Equipment Srl, Charlatte Manutention, TIPS d.o.o., TUG Technologies Corporation, Fast Global Solutions Inc., NMC-WOLLARD, Inc, and Sovam S.A.S.